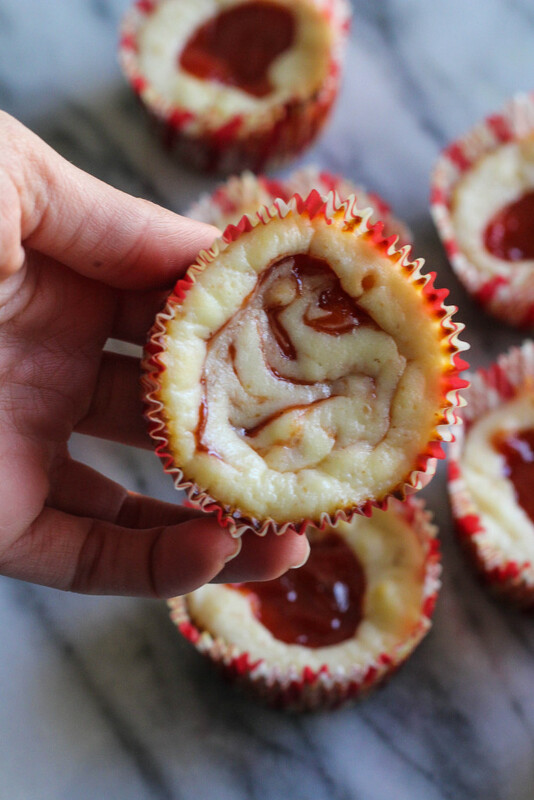 Your Valentine will fall in love all over again after tasting these Guava Cheesecake Cups. 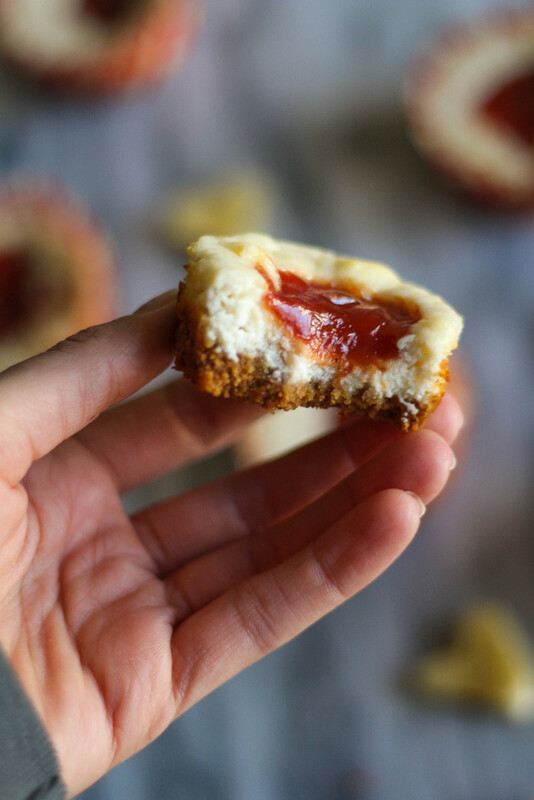 The sweet guava jam mixed with the tanginess of cheesecake is a match made in heaven. For some reason (ok, the reason is evident) Valentine’s Day gets such a bad wrap. Single people everywhere loathe the holiday for its greeting card propaganda and constant reminder of what may be a less-than-ideal love life. Yeah… I’ve been there. But I got through it… with dessert. Oops. Valentine’s Day is also known as the Feast of Saint Valentine. I mean, come on. It’s about love, it’s about feasts, I love feasts, therefore I love Valentine’s Day. Kapeesh? Now, I’m teaming up with my girls [see below] to bring you some shareable sweets, so that you may give your Valentine the gift of a happy stomach. For some reason, as soon as this idea was brought up, I thought about cheesecake. Last year I made Christian some red velvet cheesecake swirl brownies that were really good, but I didn’t want to do the same thing. 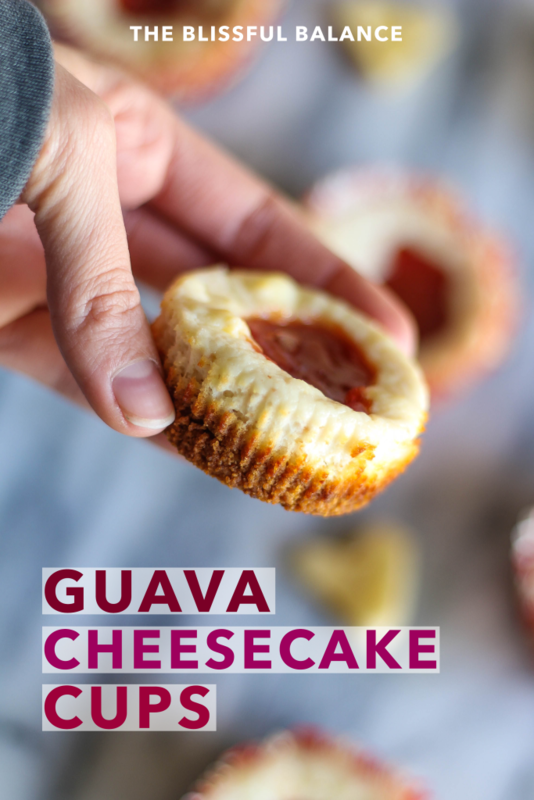 I stuck with the red and white theme, and replaced your typical strawberry cheesecake combo with a total upgrade: guava cheesecake. Funny enough, my first taste of guava came from a guava pastry, or a ‘pastelito’ in Miami as a child. I’ve never actually had a real guava fruit… I’ve had guava pastries, guava paste, guava jam… no actual guava. BUT, I still think that my opinion on guava is valid. I mean, that’s three different forms of guava. Some would call that expertise. Most wouldn’t, but some would. My mom was telling me how when she was a young girl in Cuba, they used to eat guava and cream cheese on a cracker, and that was dessert. That doesn’t sound like much, but seriously… it’s really freakin’ good. There are a couple ways to make your cups. You can either put a dollop of the guava jam on top of each cup, or you can swirl it into the cheesecake, as you can see above. Whatever floats your boat – they’re both delicious! 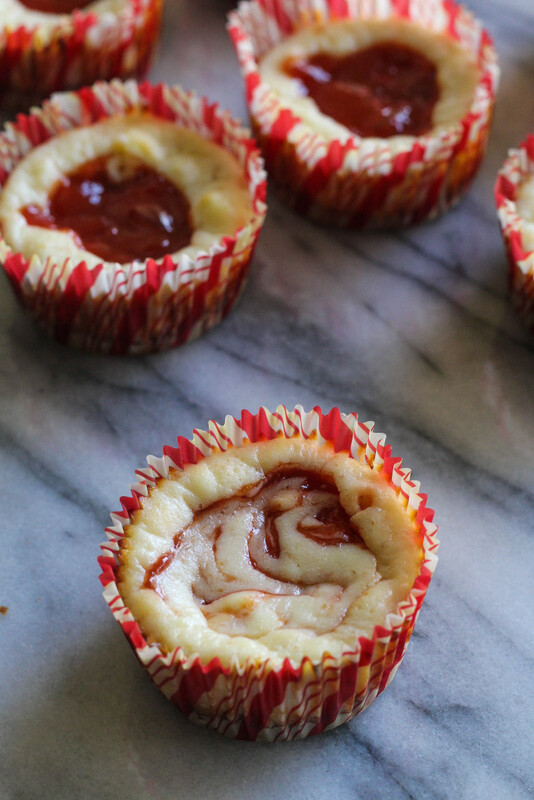 Your Valentine will thank you for these Guava Cheesecake Cups! Now that we’ve had a little chat about these delectable little bites of joy, let’s talk about love, shall we? I think these days, love tends to be relatively surface-level. Social media has transformed our means of communication, and while I enjoy utilizing it for obvious reasons, I do think it can paint a ‘different’ picture at times. You know, the photos women share of their fat diamond and “I said yes!” Instagram post… What’s really important here? That you just agreed to spend the rest of your life with one person, or that everyone knows how big of a of ring is shimmering on your finger? My parents just celebrated their 30th wedding anniversary a couple weeks ago. Their love story blows my mind to this day. My mom was living in Miami and my dad was living in Shreveport, Louisiana. They worked for the same company, unbeknownst to them, but soon crossed paths when my father was in town for some training. They met in the Miami headquarters of their company, and the rest was history. One month later, they were married. One month. They didn’t even live in the same city. They communicated via phone calls. They got married in my grandparents back yard in Miami. My mom picked everything up and moved to Shreveport (a huge sacrifice for a Miami resident, I must say). Thirty years later, they still hold hands while walking down the street. This is love. And it inspires me everyday. 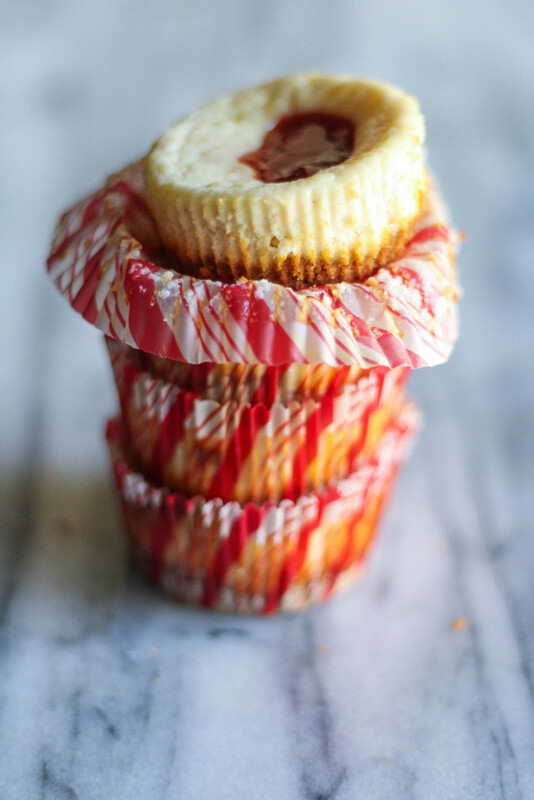 Preheat the oven to 350 degrees and place cupcake papers into a muffin tin. Spray each one with cooking spray. Add the graham crackers and margarine into a food processor. Pulse until well-combined. Using an ice cream scooper, scoop graham cracker and margarine mixture into each container. Using your fingers, press down each one to form the crust. In an electric mixer, add in the cream cheese, yogurt, egg whites and vanilla extract. Mix on low until well combined. Add in the sugar and flour. Use mixer to stir until well combined. Using an ice cream scoop, scoop batter into each muffin holder. 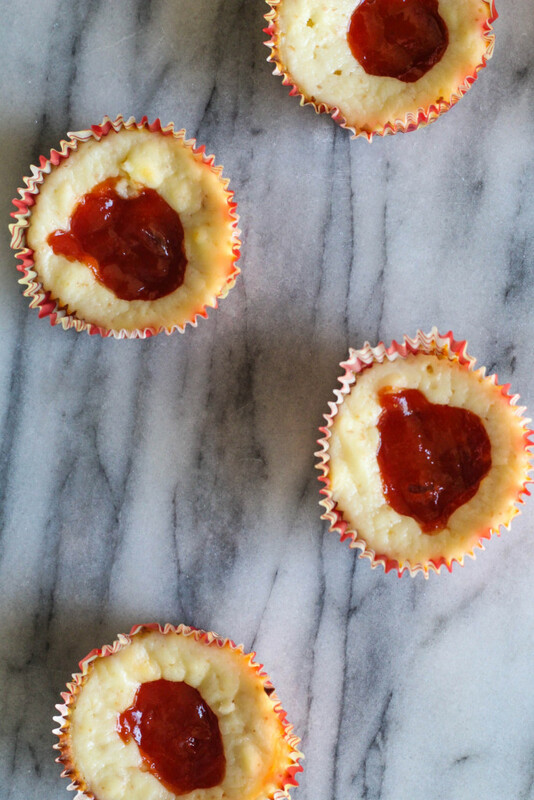 Using a tablespoon, add ½ tbsp of guava jam onto each cup. Bake for 25-30 minutes. If they are still a bit liquidy after 30 min, don't worry. Take them out - they will continue cooking and set out of the oven. *Don't worry if your cream cheese is not completely breaking up. It will melt in the oven. Tell me the story of how you met your SO, or how your parents met, or your grandparents. 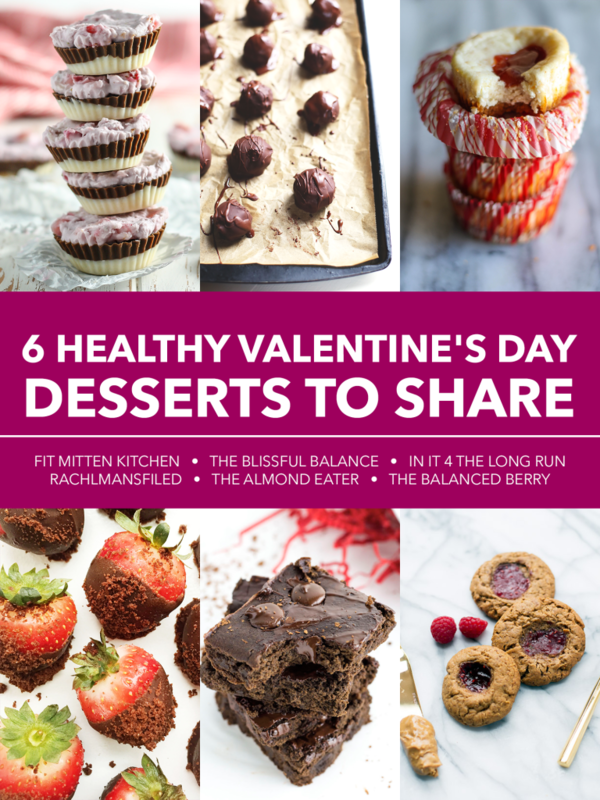 As promised, here are five more shareable dessert recipes perfect to gift on Valentine’s Day! 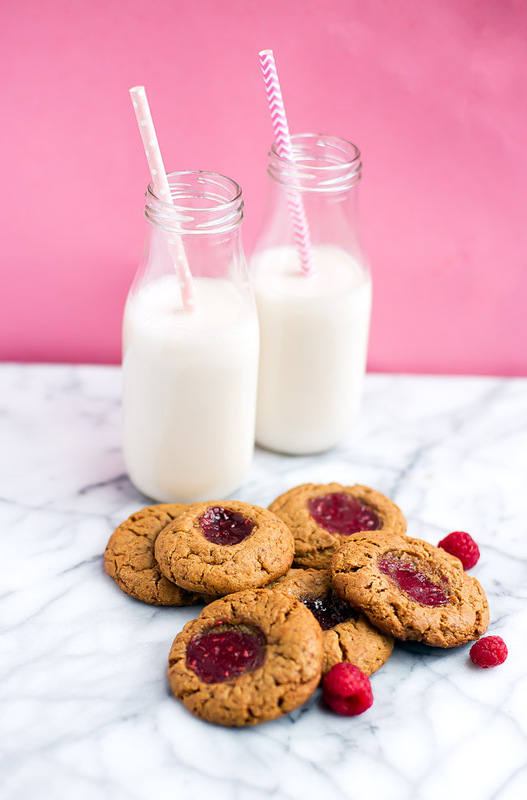 Gluten free peanut butter cookies with a kiss of jam right in the middle. Only requires six ingredients, and comes together in one bowl! 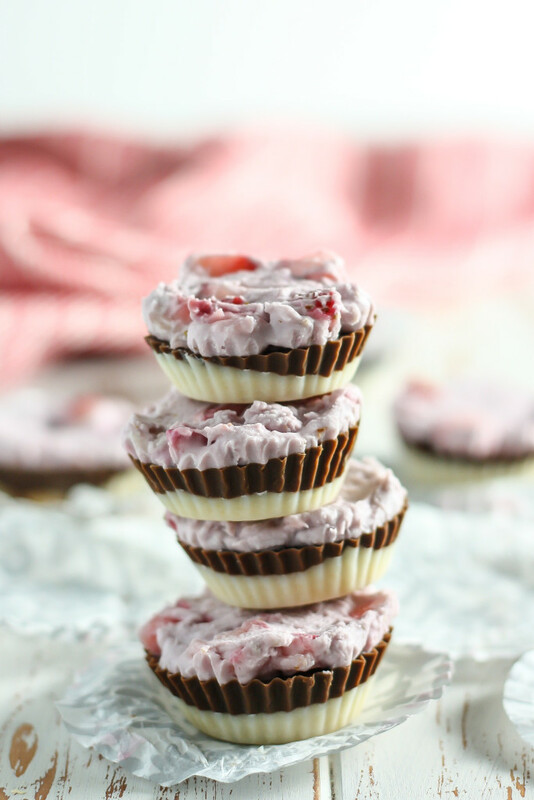 A layered mix of coconut butter in the classic ice cream flavor, these Vegan Neapolitan Coconut Butter Cups are a healthier way to indulge for Valentine’s Day. 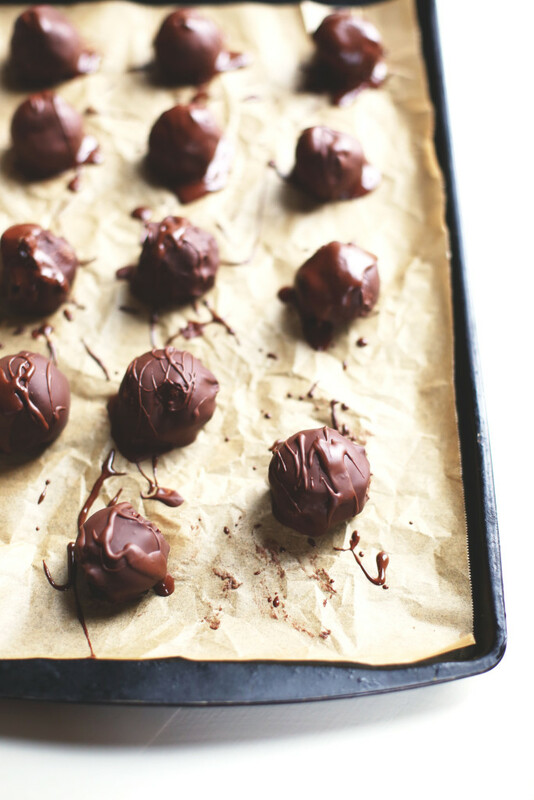 Celebrate Valentine’s Day right with these scrumptious vegan chocolate truffles that will melt in your mouth. 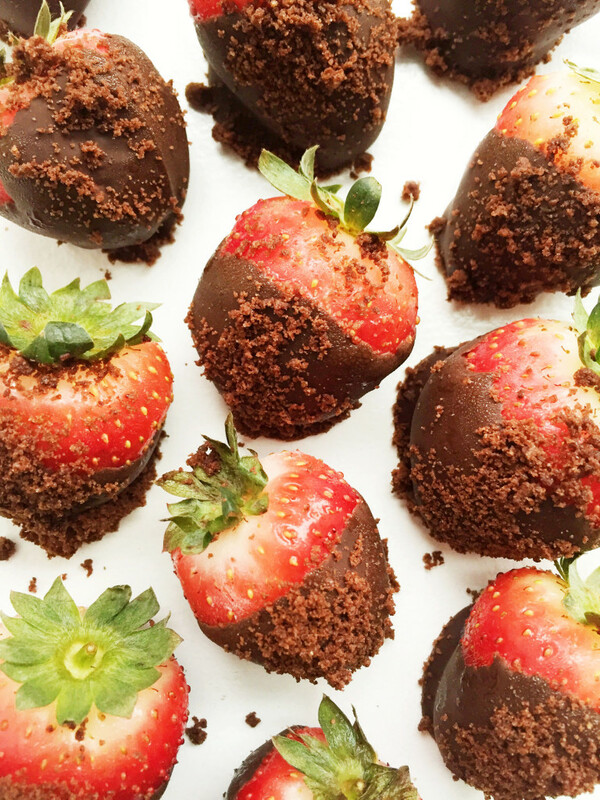 Gluten Free Cookie Dusted Dark Chocolate Covered Strawberries, the perfect indulgent yet healthy treat! Save these for later – hover over the image to pin! I LOVE that story! One month later married?! They were meant to be. My grandparents have a unique story…he was (is) Jewish, she was Catholic. He was on the rich side of town, she lived on the poorer side. Both families disapproved of the relationship but the eloped at at 21 and kept it a secret for 3 months. 62 years later they are still obsessed with each other. Wait…that is the best story I have ever heard. I may have teared up a little bit. Your parents sound like the definition of soulmates. My boyfriend and I technically “met” in college, but never really got to know each other despite the fact that we went to a tiny school and had a ton of the same friends. A few years after grad, we reconnected and hit it off. 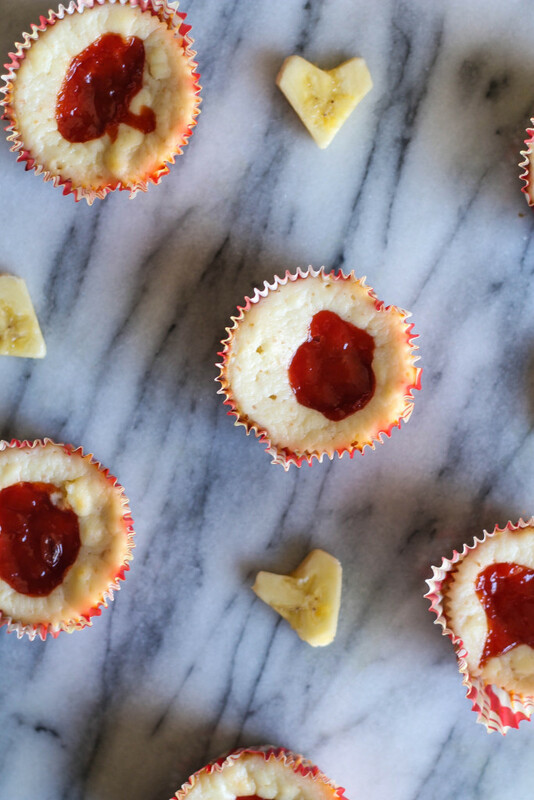 Les @ The Balanced Berry recently posted…Peanut Butter and Jelly Cookies + 5 more Valentine’s Day Desserts to Share! Literally LOVE these guava pastries I use to get back in undergrad at a little Cuban place..so I KNOW I’d love these! Look SO delicious Christina! Lol are you talking about Mi Apa? ONE MONTH!?! Amazing. That story melts my heart! My husband and I dated for three months before he bought a ring. Sometimes ya just know. One thing I know is that cheesecake is my favsie and the dollop of jam on the top is just icing on the cake for these sweet cakes! Such a sweet story. My parents dated for years. My mom was actually dating another guy the whole time, then eventually had to make a decision and went with my dad. It’s not so romantic, but it’s a funny story. Oh my gosh, that is almost the exact story of my boyfriend’s mother. She was dating someone at the same time too and eventually had to choose haha!! I feel like that doesn’t happen nowadays. OH my gosshhhh. Your parents are darling. My husband chased me for a while, not gonnna lie, lol. I’m just stubborn though :-p My husband and I technically met for the first time in the 5th grade. But we didn’t date until HS. And I still wasn’t convinced until later on in college. Hahaha, I’m horrible. lol But I love him to death and he makes me laugh like no other. That story is so sweet! I love hearing about how older people met and fell in love. I’m a sucker for all those stories! Wow best girlfriend award–I usually make Miguel nothing for Valentine’s Day lolol WAIT I did the first year we were dating. After that, not so much. Haha I think maybe its different because we’ve been long distance for a couple years. These are so cute! I don’t think I’ve ever tasted guava before. 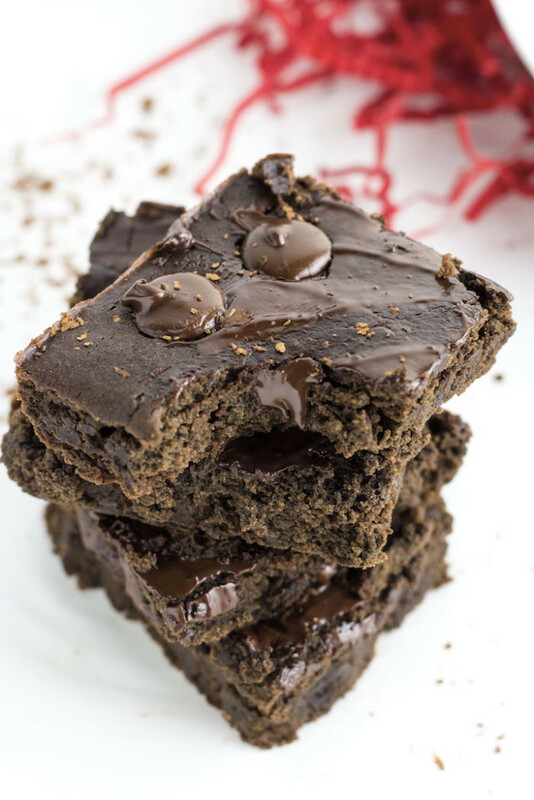 I love how all of your recipes have family history attached to them, love reading about that! I also have had guava paste in my cabinet for over 2 years now and haven’t known what to do with it, now I know! Family and food are such a huge part of my life, and most of the time are mushed together! Haha yes yes use it!! so good. I am SUCH a sucker for a good love story – and your parents’ story is ridiculously adorable! One month…I guess it’s true that when you know, you know! Omg. That’s seriously the best love story. I haven’t dated anyone too too seriously in a while so I tend to keep my relationships almost completely private. It’s funny to see how people act on social media vs. how they treat each other in person. Yeah, exactly… Christian never shares anything on social media which I don’t care about, whereas I’m so used to social media I like to share photos most of the time bc I like looking back on them later on. But if we’re not in a good place, I wouldn’t be posting all over social media like we are! I NEED to recreate a dairy free version of this, because oh my yum GUAVA!!! I love hearing stories of how people met!! 30 years – that is so so amazing. Have you read Modern Romance? Aziz Ansari highlights some cute stories of how people meet. These cheesecakes look absolutely amazing!! And I definitely agreed with what you said about our definitions and perceptions of love changing. Your parents love story is absolutely beautiful and inspiring! Happy Valentine’s Day. These cheesecakes look absolutely amazing!! And I definitely agree with what you said about our perceptions and definitions of love. Your parents love story is absolutely beautiful and inspiring! Happy Valentine’s Day.